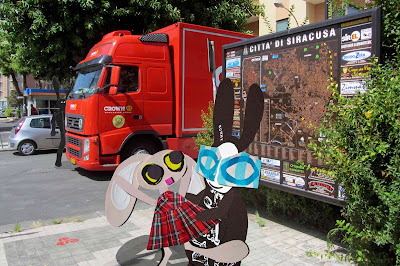 The Wabbit and Lapinette wandered around their honeymoon destination with hardly a care in the world. There was no Department, or paperwork or enemies. It was sunny and quiet - almost idyllic - as Siracusa basked in a late Sicilian heat wave. 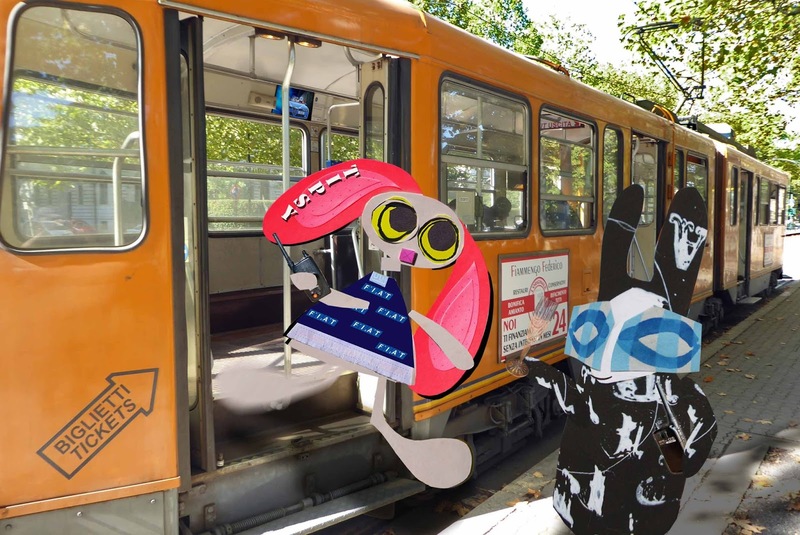 The Wabbit swept Lapinette in the air and smiled. Lapinette's eyes fluttered. "What about the Adventure Caffè?" "Ah yes," replied the Wabbit; "How the binky are we going to find out what kind of adventure we had?" Lapinette threw up her arms and yelled. "We'll have to do it ourselves - without Skratch." The Wabbit smirked in delight. "Skratch directed it." "He'll certainly know then," said Lapinette. She looked straight at the Wabbit as he gave it deep thought. "I'm not sure," he said; "I'm certain he'd question any form of intentionality." Lapinette pirouetted. "Skratch is not given to auteurism." The Wabbit pirouetted too. 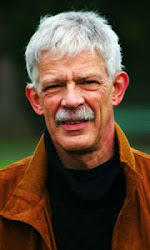 "But he gave our adventure a style which played with dynamics of spectacle and emotion." Lapinette knew what she was talking about when it came to spectacle. "Skratch defied convention and placed the reception before the wedding." The Wabbit struck a pose. "That strategy was dark, dangerous and difficult - and involved falling from giant clocks." Lapinette nodded, but she'd noticed something from the corner of her eye. "Did you see an Agent of Rabit?" The Wabbit winked and shrugged and winked again. "Maybe he's on holiday?" 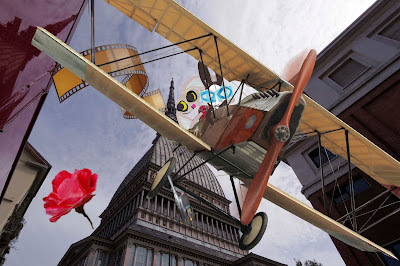 Susan the Biplane extracted the Wabbit and Lapinette from the gallery of the Film Museum and swooped along Via Garibaldi. The Wabbit grinned ear to ear. "Where are we going, Susan?" Susan waggled her wings and her voice crackled over the radio. "I'm transporting Mr and Mrs Wabbit to the Adventure Hotel of course." The Wabbit gulped. Lapinette laughed and gazed down. People looked tiny in the streets, but she waved to them anyway and threw down a flower. With a sudden roar of her engines, Susan tore wildly around the city. She flew like she'd never flown, in an acrobatic display that astonished the Wabbit. She whizzed down Corso Svizzera and across to Lingotto. She skimmed the River Po and buzzed the funicular railway all the way up to Superga. Then she plunged steeply to Piazza Vittorio Veneto. The Wabbit clung to the fuselage with one paw and gripped Lapinette's paw with the other. "Are you looking for a promotion, Susan?" he gasped. Susan's radio crackled. "This tour is a wedding gift from the Department." The Wabbit shrugged suspiciously. "And ..?" Susan's engine changed note. "And you're wanted back on duty in 24 hours." 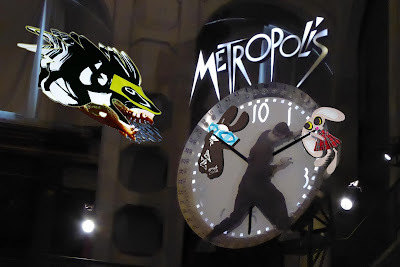 The Wabbit's 28 teeth flashed momentarily. He smashed his radio on the fuselage and let it slip from his paws. "Take your time," grinned the Wabbit. The scene faded in and the crowd gaped. 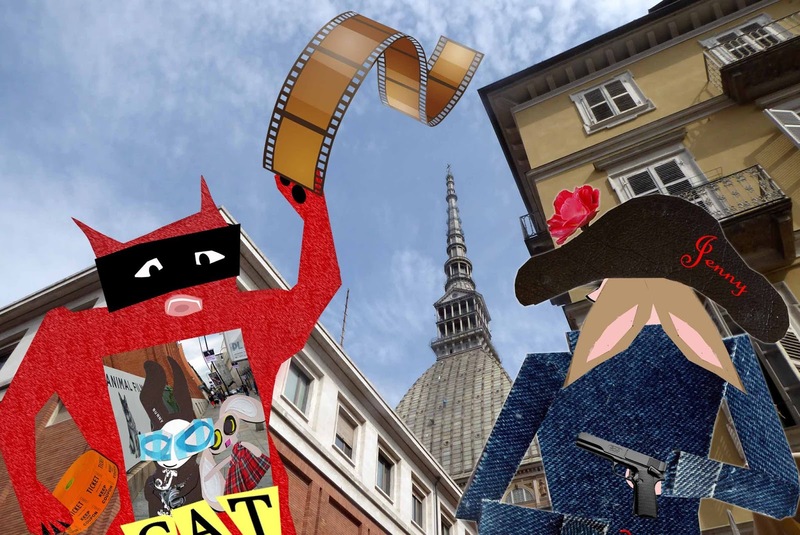 There was applause for the Wabbit and Lapinette but a thunderous roar for ex Cardinal Lapin, whose face now beamed down from every restaurant counter in Turin. Lapin's voice echoed through the vast hall of the Film Museum. "We are gathered together to unite these two rabbits in marriage." A hush fell. "Some say not before time," added Lapin. The glint in his eye lit up the whole space. Waves of polite laughter rippled through the audience but then a silence fell as Lapin whispered inaudibly, "Where's the ring, Wabbit!" This flashed on the screen as sub titles. The collective intake of breath prompted some to quietly shed a tear. "I have it in my fur," said the Wabbit. The audience cringed as he searched frantically, producing several items, none of them matching a ring. Lapinette smiled. "It's stuck to your paw, Wabbit." The audience cheered. "Throw me the ring," suggested Lapinette. Her head nodded and her ears trembled. 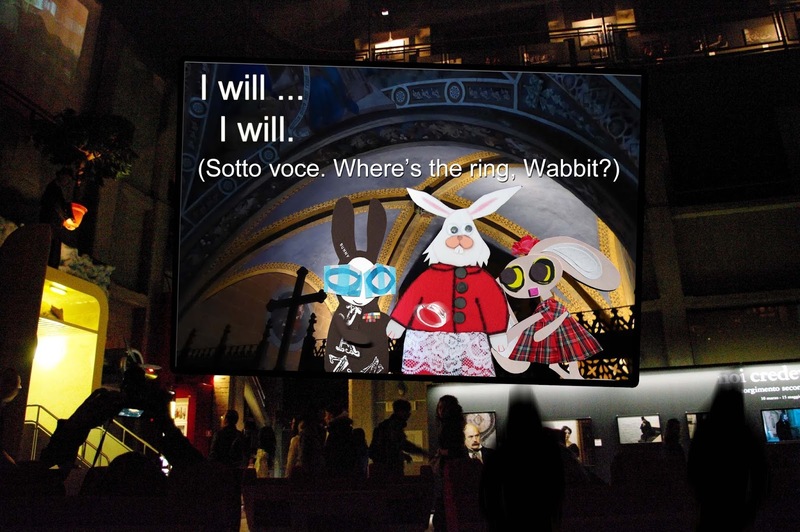 The audience gulped as the Wabbit measured the distance and flicked the ring in the air. It sparkled and span and looped twice before it headed straight for Lapinette's left paw, where it stuck like glue. Lapin smiled blessings. "You may kiss the bride." But the Wabbit had already begun. Moloch removed his restraining hands and the Wabbit and Lapinette dropped onto a giant, heart-shaped bed. Lapinette bounced a few times. The Wabbit tucked in and gazed at Lapinette. But cheering ensued so they turned to stare out from a giant movie screen at an adoring audience. Lapinette giggled. "What about all these people?" "This bed feels much too comfy to bother about them," whispered the Wabbit. Applause broke out. "Can they hear us?" asked Lapinette. The audience laughed and whistled and cheered. "We seem to have sub titles," murmured the Wabbit. His words flashed up on the screen as sub titles. The audience repeated them loudly. Clapping spread around the venue. "Maybe they'll go away!" sighed Lapinette. This met with laughter - the Wabbit and Lapinette could do no wrong and their ecstatic audience repeated and cheered every word they uttered. "Wonderful," shouted a critic. "Groundbreaking!" yelled another. 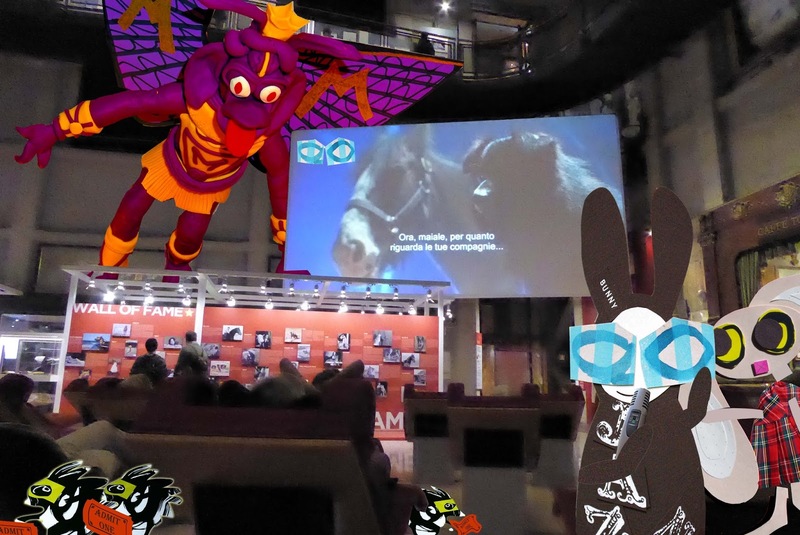 The Wabbit decided to go along with things and faced the audience directly. "Technically speaking, we're both supposed to keep one foot on the floor." The audience laughed for some time. Lapinette made a mock scowl. "Wabbit! That stopped in 1965." The crowd screeched and howled and stamped their feet as if they'd never heard a joke before. The Wabbit fumbled around at the back of the bed and found a switch. The screen suddenly grew dark. "Roll credits," murmured the Wabbit. The balcony tilted and the Wabbit and Lapinette slid downwards into a strange space, entirely composed of movie portraits. They thought they would crash to a floor that was indefinite and could hardly be seen. 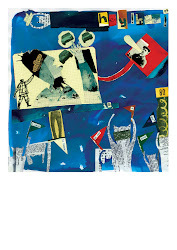 But Moloch was there to help and he spread his strong arms to prevent them plummeting down a wall of photos. "This is the Hall of Glamour," said Moloch. The Wabbit gazed along the portraits. "It's a bit steep," he observed. He clung onto Moloch's arm and gazed down. "What's at the bottom?" asked Lapinette. "The Well of Fame," replied Moloch; "but you really don't want to visit. It's a long way down - and shallower than you think." "I didn't take even one of these photos," said the Wabbit. Moloch cast large eyes up and along. He sighed. "I'm quite upset my own portrait's not here. You know, I used to be famous in the old silent movie days." "I think we'll all be here some day," said Lapinette. "But in the mean time," asked the Wabbit; "how do we get out?" Moloch's eyes twinkled. "We have to ask the stars." Lapinette thought she would try, so she addressed the portraits directly. "What's the way out?" A murmuring commenced and it sounded much like a conversation. Then a single voice spoke. "Just think yourselves out." Lapinette looked at all the pictures. "Who said that?" "Me" confessed the Wabbit. The Skuttle moved too close to the clock and nudged it. It creaked ominously. Lapinette looked at the Wabbit and the Wabbit looked back with gritted teeth. Something snapped and things started to fall apart. Clock hands fell like giant spears. The crowd looked up in horror as Lapinette tumbled from the clock face. With a crack like rotten wood, the Wabbit's second hand broke away. He twisted and grabbed it firmly. Then with a thrust he slowed Lapinette's wild descent, but together with the hand, they continued to fall. The crowd oohed and aahed. 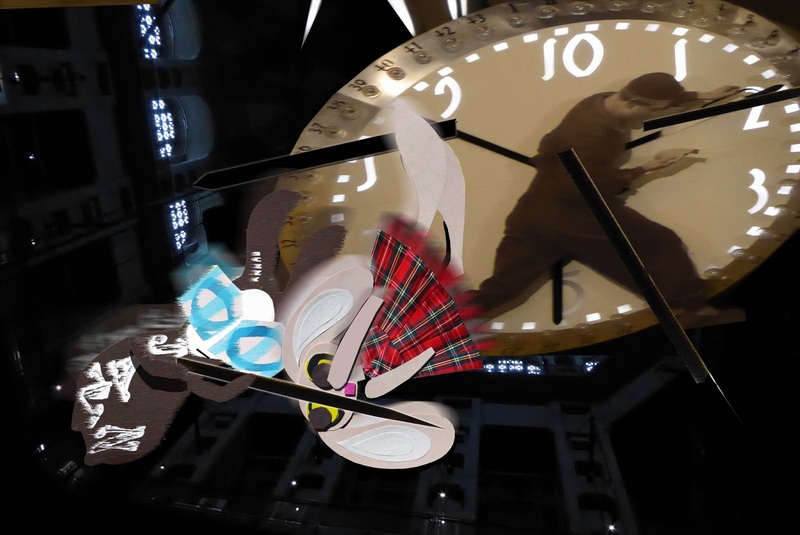 The Wabbit angled the clock hand near to vertical and when it hit the ground he twisted with all his might. They vaulted back up, to a massive cheer. Lapinette grabbed a balcony and scrambled on, but the Wabbit disappeared below her. Moments later he was back. Applause broke out. "I'm getting to like this," he grinned. He was on his way down again - but Lapinette grabbed him just before he plunged and swung him safely onto the balcony. A cheer from the crowd was quickly followed by a fearful gasp. Visitors scattered as the giant hand crashed down and stuck quivering in the ground. The crowd roared and roared for more. So the Wabbit waved limply and made an impromptu speech about the fragility of time. Lapinette waved too and turned to the Wabbit with a sigh of relief. "What shall we do for our next trick?" gasped the Wabbit. 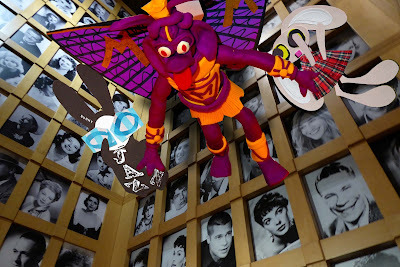 The Wabbit's installation was his own idea. This was quite a surprise because he disapproved of such things. But it seemed like a good intervention to both liven up the photo exhibition and make a point. 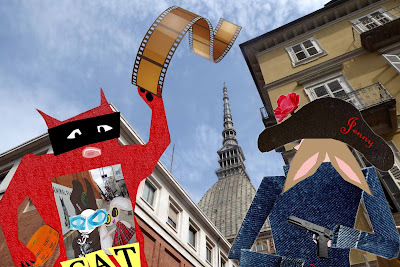 The Wabbit's plan had interested Lapinette. "It will send a message about power, time and the oppression of the working rabbit." She suggested they dive from the roof and hang on opposite clock hands. Both would appear to pull in opposite directions, representing the plight of the working collective and the ambiguous nature of time itself. The dive was relatively easy but the grab was difficult. Wabbit hung perilously from the minute hand. "So far so good," he gasped. Lapinette dangled from the hour hand and swung back and forth. But with a clang it suddenly lurched down by an hour. "It's fixed. It's not supposed to do that," snorted the Wabbit. There was a bang. Now the minute hand dropped by ten minutes, taking the Wabbit with it. He scrabbled and grunted and scowled - but he hung on. From below, the crowd cheered massively at what they thought was daring display. Another cheer from the ground alerted Lapinette. They both turned. It was a mammoth flying Skuttle, like none they'd ever seen. Blue spray shot from monster jaws. Jagged teeth gnashed. Fins thrashed. "I haven't got time for this," snapped the Wabbit. 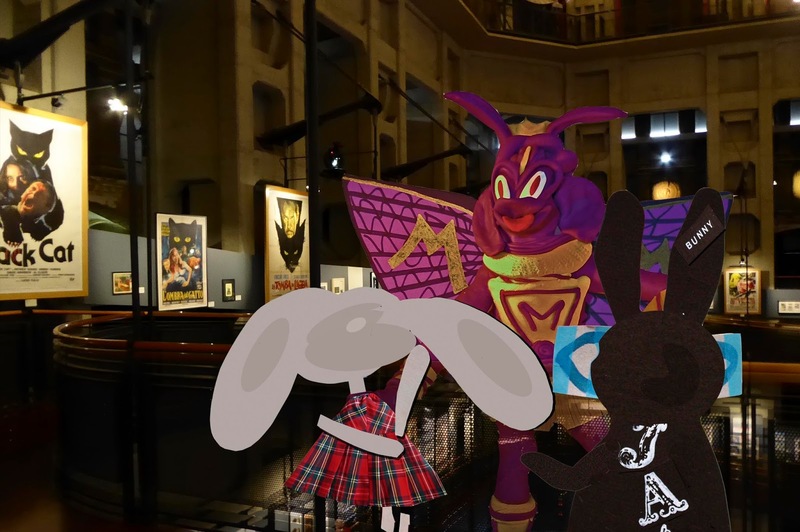 The Wabbit and Lapinette assessed the movie museum as a likely venue for their photo exhibition. They were about to make a final decision, when Moloch peered over the balcony rail. "May I be of assistance?" "We need an exhibition space," smiled Lapinette. "Then look no further," boomed Moloch. "We have all you might require: walls, seats, rest rooms, stairs, lifts - all that sort of thing. And a bar and a restaurant." "What kind of a bar?" asked the Wabbit. "Wild West of course!" replied Moloch. The Wabbit was delighted but he wanted to know how much it would cost. Moloch tut tut tutted. "No cost. I'm on the Board as the ex officio advisor on Sacrifices." "We couldn't possibly impose on your generous nature," giggled Lapinette. Moloch drew himself to his full height (which was considerable) and spoke with authority. "A not-for-profit activity in pursuit of community cohesion, attracts no particular charge." Lapinette raised a paw. "May we sell copies of our original and exciting images?" "In the shop," laughed Moloch. The Wabbit clapped his paws. "Then it's a done deal." "Just one thing," added Moloch. Lapinette and the Wabbit glanced at each other. Moloch's wings rose menacingly. "I'll be signing copies of Cabiria: Moloch's Final Cut." "What could possible go wrong?" chirped the Wabbit.